I work as an energy systems engineer at Texas Instruments in Dallas, Texas. My research focuses on electrical power and energy systems. I try to make energy systems and power converters more efficient, more reliable, smaller, cheaper, and more robust. When I have time, I like to work on a variety of projects as well. April 2015 through March 2016: Yes, it's been a long time since I updated this site. Let's just say this past year has been very busy. It's been tough personally and professionally. My wonderful mentor Dave Freeman passed away. I miss him, his wit and wisdom, a lot. This past year had some high points too. I love being a father and watching my daughter grow up. I've now been to six continents! (have yet to see penguins in Antarctica...) I also serve as an Associate Editor for the IEEE Transactions on Power Electronics and as the North America Regional Chair of the IEEE Power Electronics Society. March 2015: I had the great privilege of celebrating Pi Day with pecan pie on March 14 at 9:26pm (3.1415926...). I enjoyed presenting some research at APEC 2015 and talking with friends and colleagues working in power electronics around the globe. Our chip came back and we have begun testing. Let's hope there aren't any major problems. February 2015: This month I had the opportunity to give a few talks at universities. One talk was on the world's smallest 12V, 10A power supply at the Power and Energy Conference at Illinois. Another talk was on intraprenuership at UIUC's Pulse Conference. I also gave a talk on differential power processing at Texas A&M. Despite some challenging weather issues with these trips, it was great being back in a research environment again and seeing old friends. January 2015: Bam! We sent our part out to be fabricated. Now let's hope everything works when we start testing it. I am publishing a paper in the first edition of the recently resurrected TI Tech Journal. It's helpful to be able to discuss technology openly without having to be concerned about IP issues since it's an internal publication. December 2014: Alas, we did not win the Kilby Innovation Award. It was great being a finalist though. In other news, my first child was born! She's a gift. Gloria was (and still is) amazing. We're thankful for the family members who helped us out. I also found out that I was elected to the IEEE Power Electronics Society's AdCom. I'm guessing I'm the youngest person ever elected to that role. November 2014: I've been mostly focusing on my project. I also submitted the final version of two papers I will present at APEC 2015. October 2014: The project plan review is complete now and we're off to the races! The next few months are going to be intense I think. Gloria and I had a chance to see family in Brooklyn one weekend. The kids are growing up so fast! September 2014: I had a great time attending ECCE and INTELEC. I was impressed by Pittsburgh and enjoyed seeing colleagues from all over. I was surprised and humbled to be nominated for the IEEE PELS administrative committee (leadership committee). It was my first time attending INTELEC. Vancouver is a beautiful city and I learned more about telecom energy needs. Last, but not least, the project I am working on made it to the final round (last 8) of the Jack Kilby Innovation Award (highest award for innovation at TI)! I got to present our work in front of a panel of some of TI's top technical and business leaders. We'll find out in December who won. August 2014: This month had several firsts for me. I attended my first quinceañera. That was fun! We also bought our first house. My first product as a lead systems engineer was kicked off too. July 2014: The research stage of my project is over and now it's on to production! I have completed my time in Kilby Labs and am moving on to the business unit responsible for making products based on the technology we have developed. Gloria and I also enjoyed a beautiful weekend in Washington/Idaho with my brothers and their wives. June 2014: This month I found out that I will be the lead systems engineer on the first product based on the research we've been doing. My time in Kilby Labs will come to an end soon and I will be moved to a business unit. I have mixed feelings but am hopeful. I also participated as a judge in TI Innovation Challenge. The contestants had some amazing projects and I am excited about the winning teams. May 2014: I spent two weeks in Taiwan and Japan for a conference, supplier meetings, and visiting with friends and family. It was an enjoyable time but also tiring from all the travel. We also got our second/third test chips back and started testing the complete solution. Good results are observed so far but more testing is needed. Also, I helped host the first IEEE PELS Young Engineers Webinar this month. April 2014: This month I started the early work on my next project(s). I visited some customers in Austin to get their reactions to the results of my current research project so that their feedback can be considered when planning the product TI will release in the future. March 2014: After returning from an adventure, I had lots to do. While attending APEC in Fort Worth, I met with customers, listened to research presentations/posters, and talked with a lot of people. As the Young Professionals Chair of the IEEE Power Electronics Society, I helped to facilitate a tour of TI's Richardson Fab and Kilby Labs and a reception for students and young professionals. Both were a lot of fun! We also held a review of the results from the test chip I've been working on - everything looks quite promising! February 2014: Gloria and I went on an epic trip - four countries in three weeks. We left in mid February and didn't return until mid March. January 2014: Not very much happened in January. It was mildy cold in Dallas and I grew a beard. I continued to take measurements using our test chip. December 2013: The sad news this past month was that I was forced to withdraw the two APEC papers and one journal paper about my work at TI. Although I'm quite disappointed, I take consolation in that my project seems to be successful enough that TI wants to limit/control information flow about it. Also, we got our test chip back this month and the results so far have been quite good. November 2013: I wrote and submitted two APEC papers. My paper in the Journal for Emerging and Selected Topics in Power Electronics was accepted with minor changes required. While we're waiting to get our test chip manufactured, I've taken on a short term, side project that is quite interesting. Lastly, I made pecan pie for Thanksgiving! October 2013: We sent our test chip out to be fabricated! I'm looking forward to getting results. The APEC papers I submitted were accepted so I will hopefully be giving two presentations in March on that work. I had jury duty for the first time ever. It turned out better than I expected and I learned a thing or two in the process. September 2013: This was a month full of activity. I had a great time at the IEEE Energy Conversion Congress and Expo (ECCE). It was my favorite ECCE so far. We had a fun and interactive student/young professional reception hosted by the IEEE Power Electronics Society (PELS). I also was invited to give a seminar about data center power delivery at UT Arlington. Of course, regular work and university research projects and going full steam ahead too. August 2013: I think I can officially call myself an inventor now! My first patent was issued this month. The patent (US 8,508,074) is titled "System and Method for Optimizing Solar Power Conversion". Most of the interns left this month after a great summer. The lab is more quiet now. July 2013: I submitted a couple of papers to the Applied Power Electronics Conference about the research I've been doing at Kilby Labs. Hopefully they get accepted and I can share more details. June 2013: We have lots of interns in Kilby Labs now. I am specifically helping two with their projects this summer. I also have been working on the IP portfolio of my current project. The lawyers want me to write up several invention disclosures. Maybe I can change my title to "Inventor" for a few days? :) I must say, my job is pretty sweet. 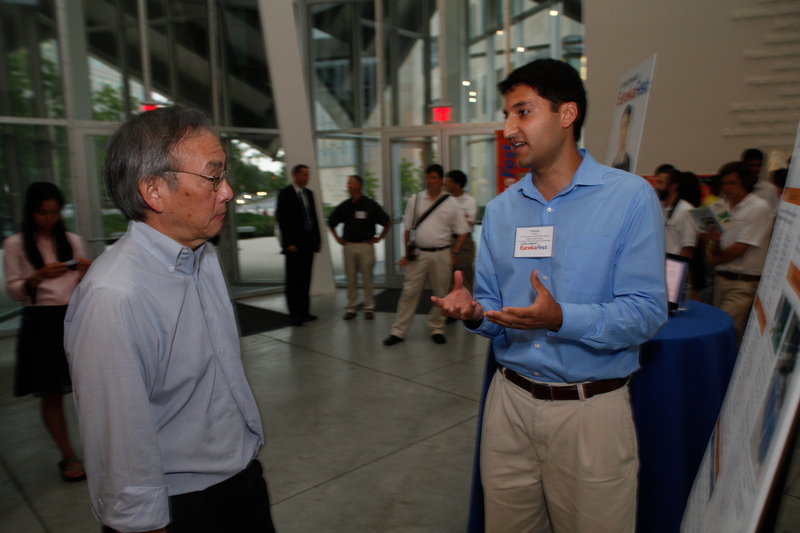 May 2013: I participated in a roundtable with TI's CEO. Overall, I'm quite impressed by him. Gloria and I took a whirlwind trip to Illinois and Washington that included walking down the aisle (graduation aisle, that is) and participating in my brother's wedding. My research project is transitioning from system design to chip design. I'm excited to see how it all will turn out. April 2013: Thankfully, April was fairly laid back. Gloria and I had a chance to take a little vacation. I also went on a trip to Illinois to meet with some suppliers and to start setting up a research collaboration with TI and the University of Illinois. Good things to come I hope! March 2013: I think I was away from home more than I was at home in March. I supported my wife at her defense (she passed!) on March 1. I came back to Dallas for a day before leaving for Manchester, New Hampshire, to meet with collaborators. I also attended the Applied Power Electronics Conference in Long Beach, California, before heading directly to a wedding in Illinois. 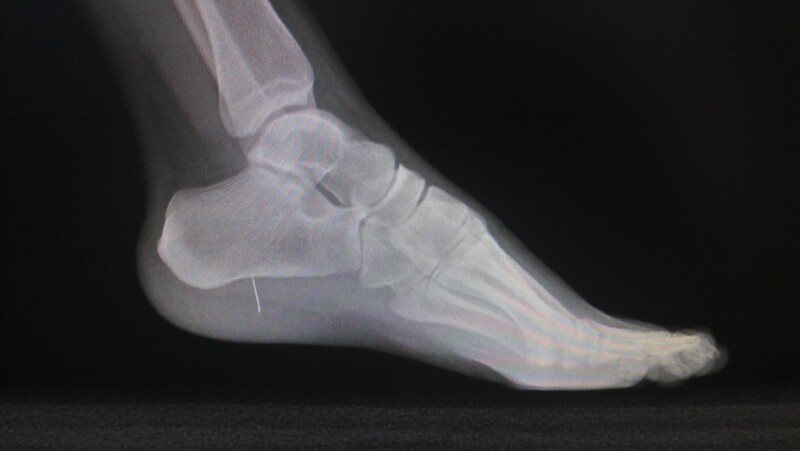 Thankfully, Gloria did not have a needle in her foot this time. February 2013: My research project is progressing well. I obtained some promising hardware results. I also had a lot of fun judging a science fair and performing at Chinese spring festival luncheon. I was really impressed with what some of the students at the science fair did. 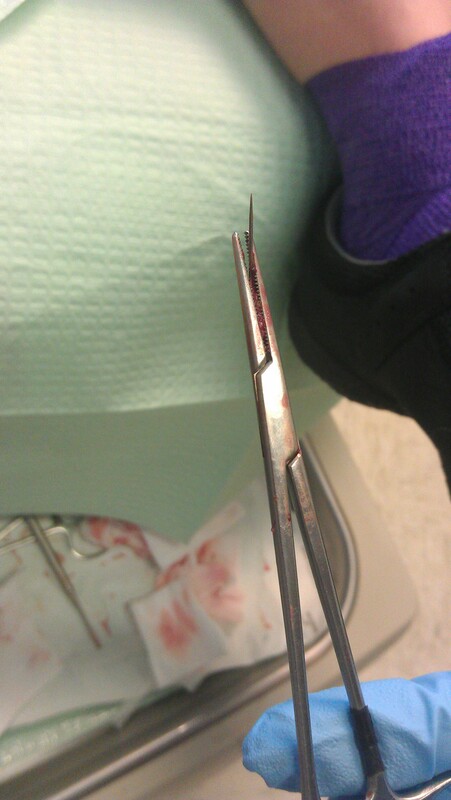 January 2013: The new year started with a bang. We had several out-of-town visitors. I went to my first rodeo in Texas. I also kicked off a new project and started to test my prototype out. Hopefully I get some good results I can share in the future. December 2012: I finished the design of my first experimental prototype since starting at TI. I enjoy working with a group of knowledgeable people that can provide constructive criticism. The warm winter weather in Texas has been a blessing. I can ride my bike to work still! November 2012: I had a great time at the IEEE Power Supply on Chip conference in San Francisco. The poster I presented was well received and generated some good conversations. I think my eye sight is getting worse though. I'm also glad it worked out to visit some friends and family who live nearby. I started working on a hardware prototype for my new project too. October 2012: My research focus at work is changing and I am on a new project now. It's not what I expected but at least I get to learn new things. I had a couple of customer visits and met some colleagues in California as well. I'm excited about having weekly Mandarin tutoring sessions now through the Chinese Initiative at TI! 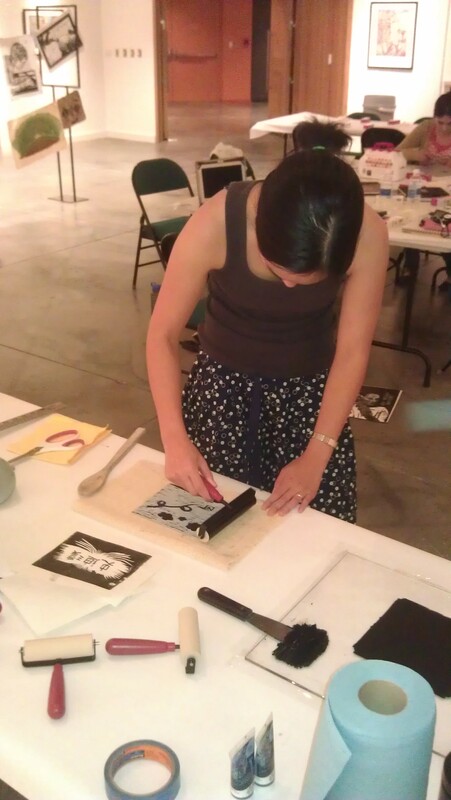 I also went to a fun relief printmaking workshop with Gloria. September 2012: My disseration is online now. I think that anyone can view it now. The rest of September was relatively uneventful except for Gloria stepping on a needle (with half of it breaking off in her heel) and my brother getting married. August 2012: A journal article I wrote was accepted for a special issue of IEEE Trans. Power Electronics on DC distribution! I also had an idea for PV system monitoring that TI is filing a patent on. I am enjoying learning a lot as I start work on a new project related to data center power delivery. July 2012: Thankfully, July was pretty low key. I'm starting to settle in to work and life in Dallas. A journal paper of mine on solar PV energy conversion was accepted so I had to submit the final files for that. Also, this article was written about some of my work in grad school. May 2012: Wow, May was busy. I successfully finished my Ph.D. (!!! ), moved to Dallas, and started working at Texas Instruments' Kilby Labs. Gloria and I also managed to squeeze in a short trip to Honduras to get our advanced open water scuba diving certification. April 2012: In April I mainly focused on getting my dissertation done. There was lots of writing and last minute experimental work. I also received the Grainger Power Engineering Award. I am grateful that my parents were able to attend my presentation and the ceremony. March 2012: The end is in sight. I have been trying hard to get my experiments working fully and to write my dissertation. I also submitted a digest to COMPEL (Workshop on Control and Modeling of Power Electronics) and found out that a paper of mine was accepted at PVSC (Photovolatics Specialists Conference). June could full of traveling. February 2012: This past month I published some of my research at the Applied Power Electronics Conference and the Power and Energy Conference at Illinois. I accepted a job offer with Texas Instruments so I will be working at Kilby Labs in Dallas when I finish my Ph.D. this summer. 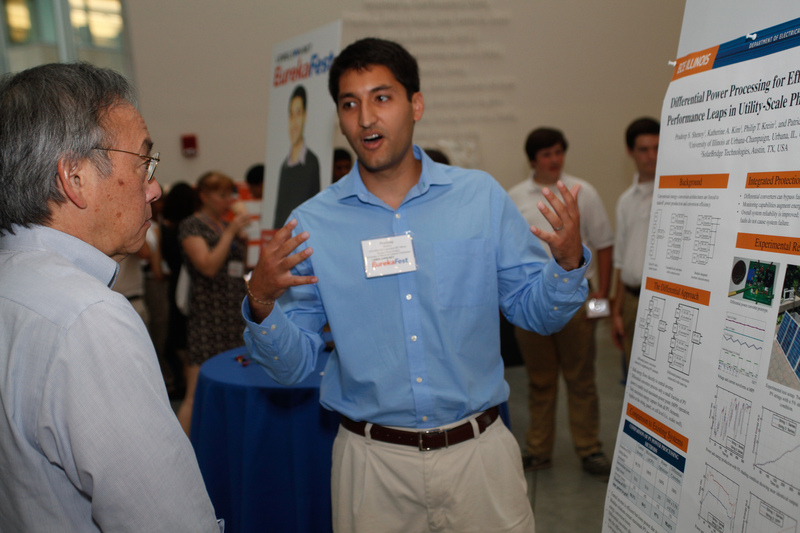 I'm also a finalist for the Lemelson-MIT $30,000 Illinois Student Prize for innovation. January 2012: I've made some progress on my experimental prototypes but still have more work to do. A couple of journal articles I was a coauthor on got accepted. I still need to write a few papers on my work. We kicked off the ARPA-E project as well this past month. I presented some of my research at the Illinois power group seminar. December 2011: I finally finished all my scheduled job interviews. There are several great opportunities so it will be tough to decide what to do next. I designed my next hardware prototype and look forward to testing it in January. I enjoyed spending time with family in Seattle and NYC over the holidays too. November 2011: Three job interviews and an international conference meant there was lots of traveling this past month. I won the best poster award at ICEAC in Istanbul! December is going to be another month of traveling with three more interviews scheduled. When will I have time to do real work?? October 2011: Both my papers for the International Conference on Energy Aware Computing were accepted so I wrote the final version and submitted those. My Applied Power Electronics Conference paper was accepted. Disney World here I come! (in February) I also found out that we got our ARPA-E Solar ADEPT grant (for $1.75 million). September 2011: I'm making progress with my research projects, enjoying teaching the power electronics lab, and exploring work options for after I graduate. I attended the Energy Conversion Congress & Expo in Phoenix and enjoyed it much more than last year's ECCE. It was great to see old friends and meet new ones. August 2011: I finished my internship at TI this month. I had a chance to visit some of the people on my TI project in Rhode Island before leaving. I'm looking forward to getting back to school to finish my Ph.D. research there. July 2011: Texas is hot! I'm having a good time though. A colleague and I submitted an invention disclosure this month for a phase management idea I had. I also submitted a paper to the Applied Power Electronics Conference and wrote a paper for the International Conference on Energy Aware Computing. The deadline for ICEAC was extended a month (!) so I might end up submitting two papers now. June 2011: After a brief week in Urbana, Gloria and I left for Dallas. I'm interning in the Texas Instruments Systems and Applications R&D Lab for the summer. I'm working with a great team of people on designing a new controller IC for microprocessor voltage regulators. May 2011: I drafted and helped submit a funding proposal which is based on something I invented. I hope our proposal does well. I also got married in May! Gloria and I went to Honduras for our honeymoon. We learned how to scuba dive. It was awesome. April 2011: This month I worked on designing and building some hardware prototypes for a couple of my research projects. I'm looking forward to getting some results. I also completed the Teacher Scholar Certificate from the Center for Teaching Excellence. March 2011: I attended the Applied Power Electronics Conference (APEC) and presented some research there. I won the best presentation award for my session and received an Ipod Nano (very small and slick). At the end of the month I wrote my PhD dissertation proposal and presented it to my PhD committee. The professors seemed to like it so they passed me. I think this means I'm officially a "PhD candidate"! February 2011: The Power and Energy Conference at Illinois (PECI) was great! We had some amazing speakers, and it went smooth overall. Thanks to everyone who made it a success. This month I also accepted an internship at Texas Instruments so it looks like I'll be spending the summer in Dallas. I was featured in a couple of articles in the ECE department and the college of engineering since I won the Illinois International Graduate Achievement Award. January 2011: I had a relaxed time at home in Seattle during the break. After getting back to school I submitted an exciting paper to the Energy Conversion Congress and Expo (ECCE). It introduces a key part of my disseration! I was also invited to facilitate a couple of sessions at the Graduate Academy for College Teaching. This program is used to teach new TAs how to teach. It was a lot of fun working with the new TAs. At the end of January, I presented some of my research at the power group's seminar. December 2010: This month I gave two presentations at the Energy Aware Computing conference in Cairo, Egypt. I met some great people there and gained more understanding of the context and need for my research. While in Cairo, I was informed that I was awarded the Illinois International Graduate Achievement Award. I'm humbled and appreciate the recognition. A big thank you to Gloria Jea for nominating me. We also found out that U of Illinois' proposal to participate in the International Future Energy Challenge was accepted! November 2010: As expected, November was intense. I finished the conference papers in time. I also worked with some of my research assistants to submit a couple of digests to the Power and Energy Conference at Illinois (PECI). The Link Energy Fellowship application is due on Dec. 1st so I worked on developing a research project for my PhD dissertation. In the process, I invented something! Prof. Krein and I submitted an invention disclosure. Now it's up to the university to decide if we go ahead with the patent process. October 2010: The two papers I submitted to the conference in Cairo got accepted so it looks like I'll be going there this December! My APEC digest was also accepted so November is going to be a busy month of paper writing. I also helped organize a team of students from Illinois to participate in the International Future Energy Challenge. We submitted a proposal to participate and will hear back in December if we got accepted. September 2010: I went to ECCE in Atlanta but could not stay the whole time since I needed to come back to school to teach. Prof. Krein wanted to submit some research to the International Conference on Energy Aware Computing in Cairo so I worked on a couple of digests for that. I also had the chance to present some of my research at a power seminar here at Illinois. I think it went quite well and people seemed interested in what I talked about. August 2010: In August, the IEEE PELS/PES Joint Student Chapter at University of Illinois won the IEEE PELS society best chapter award! This is a tremendous accomplishment since it is the first time a student chapter has ever won this award. I'm glad I had the opportunity to serve as vice president of the chapter. There were many people that helped contribute to the chapter's success but I think that much of it is due to the tremendous leadership provided by Ali Bazzi who served as the president this past year. July 2010: This past month I submitted a digest to APEC and hope it gets accepted. I think the digest was pretty solid but we'll see what other people think. My grandfather passed away so I made a trip out to California for his funeral. The weather was delightfully cool, and I enjoyed spending time with the extended family. June 2010: June has been busy! Finished my COMPEL paper and continued to work on several other research projects. I really enjoy hardware design and testing so it's been fun. I also have some great undergraduate research assistants that help. Things are coming along for the Power and Energy Conference at Illinois (PECI). I'm a co-director for the conference this year. It's been challenging at times, but I think we have a good team of people working on it. I'm in Seattle right now visiting family for a week or so before I head to Boulder for COMPEL. It's been fun to hang out and watch the World Cup! May 2010: My paper to COMPEL (a power electronics workshop held every two years) got accepted! Now I have to write the paper if I want to go to Boulder at the end of June. I wonder why COMPEL is called a workshop instead of a conference. I've seen conferences that have less going on than this "workshop". Hmm. Copyright © 2015 Pradeep Shenoy.